During a recent engine build process we nearly made a big mistake. The engine being put together was a Ferrari 308 GTB which has steel wet liners in an aluminium crankcase. 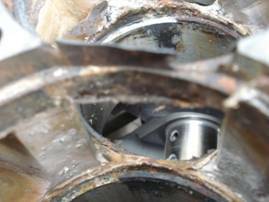 The liners sit on an annulus step in the crankcase and there is a sealing area here which is notorious for giving problems. 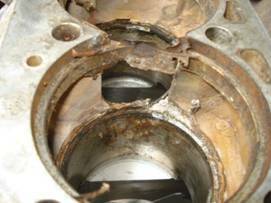 We were advised to have the crankcase Ultraseal processed to prevent any problems in this seal area. So this was carried out. As it transpired there was a client driven spec change to the engine whilst it was away being processed, so on its return we had to remove the liners. This would be very difficult according to the machine shop who had advised the Ultraseal and got it done for us, as the sealant medium would now be effectively gluing the liners into the lower bores in the block. My conclusion is a big change in our strategy and view of the Ultraseal process, back to seeing it as merely a remedial process to be used as a last resort only on individual parts that have been identified as having porosity, and not now using it as a routine quality enhancement. For OEMs to use it as a routine quality enhancement seems to me to be utter madness, when in reality the HIP (hot isostatic pressing) process is widely available, does not introduce foreign materials into the product and produces, particularly in the case of aluminium alloys, a finished component that is as free from porosity as a billet machined piece. The cost implications cannot be significant; it may even be cheaper to do than vacuum sealing.